On April 11, 2016, The Malaysian Reserve ran my column in which I wrote about fintech. One month later, I’m seated at Sasana Kijang Auditorium in Kuala Lumpur. 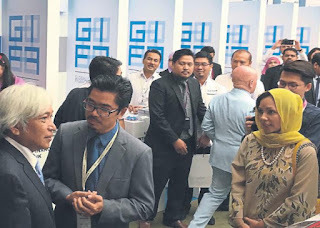 Datuk Muhammad Ibrahim, the new governor of Bank Negara Malaysia (BNM), is delivering the keynote address at the Global Islamic Finance Forum (GIFF) 5.0. One of his key messages was for Islamic financial institutions (IFIs) to adopt fintech innovations because “the potential impact of such technological disruptions is significant”. The governor said an estimated 10% to 40% of overall banking revenues could be at risk by 2025 due to fintech innovations outside banking institutions that are able to achieve a significant pricing advantage. It was also pleasing to hear from the governor that the central bank has been actively engaging with fintech firms to better understand their activities and provide guidance on the regulations that may apply to them. BNM has also commenced a review on the regulatory framework to remain appropriate while encouraging productive innovation. Subsequent to the keynote address, a few speakers also talked about fintech and disruptions. In fact, the word disruption was frequently mentioned throughout the three-day forum. Someone actually counted. It seems the word “disruption” was mentioned 593 times. Naturally, it will surface every time we engage in fintech conversation. Allow me to share some observations on the disruptions that have taken place in the financial industry. According to Brett King in his book Bank 3.0 published in 2013, there are four phases of disruption within financial services. Each phase is disruptive enough that it becomes a game changer. The first phase of disruption occurred with the arrival of the internet. With the internet came internet banking. It has changed the way customers perform banking transactions. As internet banking facilities become better and more reliable, customers’ visits to branches become fewer. Social media has amplified the disruption by Internet banking. In this social media age, financial institutions may be subjected to public pressure from the social network influence. The second phase of disruption is the emergence of smart device or phone applications. With this comes portable or mobile banking, which allows customers to perform banking transactions on the move. Except for cash deposit and withdrawal, everything that previously could only be done via the ATM machines can now be done through mobile-phones. The third phase is when we move to mobile payments on a broad scale. In this phase, we see the convergence of debit/credit cards with our mobile-phones. With this, we do not need as much cash or a plastic card anymore. In fact, with our need for physical cash reduced rapidly, the disruption will be far-reaching. As we do not need to go to the ATM machines and physical branches as much anymore, a large part of the reason for their existence disappears. In addition, as the usage of debit cards and mobile payment becomes more widespread, the legacy payment method such as the cheque becomes less relevant. This phase is not just about the accelerating demise of cash and cheques, but also the loss of physicality, where we need much fewer physical interactions with a bank for basic day-to-day banking. The fourth phase is about banking no longer being somewhere we go, but something we just do. There will be a fundamental split between banking as a distribution business and banking as a product manufacturing or credit provisioning capability. Banks are losing the basic day-to-day bank account to the mobile-phone or commodity value store. Now, you do not need to be a bank to provide banking services. Customers will go about their daily lives with banking embedded into processes that require financial products or transactional support. Home-buying will integrate with mortgage sale, travel websites will integrate with travel insurance and financing options, a retailer will give line of credit for furniture purchases, etc. In summary, the disruptions in the financial industry is real. Once upon a time, we all had to visit bank branches for any kind of banking activity. As time goes by and with the help of technology sophistication, we can do banking anytime anywhere. Now, another technology revolution is taking place. Fintech companies are offering alternative banking products that are cheaper and more convenient. As advised by the governor, IFIs have to adopt fintech innovations to remain relevant.